If you’ve never thought about how a whale’s poo affects you, the time is now. Why? Because the faecal matter of whales, oversized land mammals, seabirds and migrating fish plays a critical role in fertilising the planet. 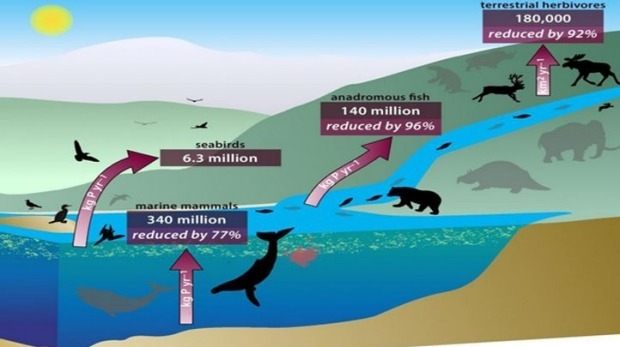 But a new study shows species decline and extinction is threatening the planet’s age-old ‘biogeochemical cycling’ system (or nutrient recycling system), potentially weakening ecosystem health, fisheries and agriculture. Developments in battery technology may not be a popular dinner party topic yet but that could change. The unveiling of Tesla’s low-cost home battery pack, the Powerwall, back in May helped raise public awareness of a field that is booming with innovation and billions of dollars of global investment… Here is our handy guide for understanding existing and emerging battery technology. Rising global temperatures could soon push the sun-baked cities of the Gulf across a threshold unknown since the start of civilization: the first to experience temperatures that are literally too hot for human survival. A scientific study released yesterday warns that at least five of the region’s great metropolises could see summer days that surpass the “human habitability” limit, with heat and humidity so high that even the healthiest people could not withstand more than a few hours outdoors. The United Nations, through its Framework Convention on Climate Change (the UNFCCC), has launched a carbon offsets initiative called Climate Neutral Now. The website says that to “keep our communities healthy and safe we need a climate neutral world”, which requires “action from all of us”. The UNFCCC argues elsewhere on the site that: “Offsetting, after measuring and reducing, is key for achieving a climate neutral world. Offsetting benefits the whole planet, not just the country in which the emissions are reduced.” We would argue (as have others) that the planet has not and will not notice offsets at all, and that they are akin to indulgences sold by the church centuries ago. First, though, how does the UNFCCC offset initiative work? From super-efficient homes in the United States to an ingenious plan for extracting fuel from living forests in Indonesia, promising projects are expanding the reach of clean, affordable energy… Plenty of smaller projects across the globe… are showing what can be done right now—in one village, one town, one city block. Check out six short and sweet stories about innovators—each recipients of funding from National Geographic’s Great Energy Challenge—who are making a difference. Along with politicians, local government, scientists and the business community, we attended the Australia-NZ Climate Change and Business conference, which took place in the run up to the next meeting of the Conference of the Parties to the UN Climate Change Convention in Paris. Following are our key take-aways from the conference: the reasons why we believe New Zealand needs to get its act together on climate change. The ongoing review of Australia’s synthetic greenhouse gas laws is being undertaken for a “whole lot of wrong reasons”, according to managing director of Scantec Stefan Jensen… Mr Jensen said the 85 per cent [reduction in hydrofluorocarbons (HFC)] was a “fairly mild target”, and showed how far behind Australia was compared with European countries like Denmark, which imposed a total ban on HFCs in 1996 with a 10-year adjustment period for industry. He said Australia should take the same approach, as the industry would then adjust. He also thinks the focus needs to shift from simply looking at exchanging HFCs for natural refrigerants to reviewing the entire HVACR industry, including licensing, compliance, technology and training. FTI Intelligence, the author of parent group FTI Consulting’s publications, have revised its forecasts, now predicting the global wind market will march towards its second consecutive record year with new installations reaching 59 GW in 2015, compared to 52 GW installed in 2014. Furthermore, total installations between 2015 and 2019 are now expected to reach an impressive 592 GW, representing a 3.3% compound annual growth rate between 2014 and 2024. A climate change deal to be agreed in Paris in December will not be able to come up with a global carbon price, the United Nations’ climate chief, Christiana Figueres, said on Tuesday. Big multinational companies and investors, and most recently oil majors, have called for a global carbon price to help spur investments in low-carbon energy. Developed nations would need to double or triple their current efforts to limit global warming to a “safe” level of 2⁰C. That’s the finding of a study published today in Nature Climate Change assessing countries’ post-2020 climate pledges ahead of December’s international climate summit in Paris. As an example, Australia would need to reduce emissions 50-66% below 2010 levels to be considered to be doing its fair share (its current target, when converted to 2010, is a 23-25% reduction). Countries have agreed to limit warming to 2⁰C above pre-industrial levels. But how do we divide up the necessary reductions in emissions fairly? Before all nations come together in Paris to seal a new deal on climate change, two questions remain: are countries’ emissions reduction targets fair, and are they sufficiently ambitious? Today we have released a new interactive website that allows you to calculate the answers to those questions, based on a new paper published in Nature Climate Change. The fortunes of fossil fuel companies will be “severely impacted” by a global climate change agreement, Prince Charles warned a financial sector summit in London on Tuesday. He also warned charities holding coal, oil or gas investments that these assets could “represent a significant conflict to their overall mission”. West and Central African lion populations have a 67% chance of halving in size in just two decades, and East African populations a 37% chance. Almost all large lion populations that once exceeded 500 individuals outside of southern Africa are declining. These declines in Africa’s apex predator occur at the same time that the continent’s mega-herbivores are also plummeting. Running Australia’s only hospital for frogs should be rewarding work, but for Cairns Frog Hospital founder and president, Deborah Pergolotti, increasing amounts of sick and injured frogs and limited public interest in the organisation presents more challenges than rewards. A Senate inquiry into the Murray-Darling Basin Plan has heard reduced water for trade is having a detrimental impact on regional communities that depend upon irrigation. About 50 people attended the morning hearing at Griffith in southern New South Wales. That number doubled in size by the afternoon. The panel of senators is attempting to establish the positive and negative consequences of federal water reform and associated Commonwealth programs. A new study published in Nature by scientists at Stanford and UC Berkeley has made waves for its finding that thus far we have dramatically underestimated the damage human-caused climate change will do to the global economy. By looking at data from 160 countries across the 50-year period from 1960 to 2010, the authors found that an average local temperature of 13°C (55°F) is economically optimal, particularly for agricultural productivity. That temperature roughly reflects the current climate in many wealthy countries like the USA, Japan, France, and China. It’s a challenge for everyone: Where should I focus my effort? What’s worth trying now, and what do I need to prepare for? To answer these questions, you need to be scanning what’s changing in the world. Here at Forum for the Future, we’re just concluding our annual scanning cycle. Our Futures Centre, based in Singapore, scans what people are talking about, what they are innovating and what is being financed on sustainability solutions. We feed in our experiences with leading companies around the world. And we take a view — part analysis, part instinct — on what will be more important on sustainable business the next two years. Here’s our current list, which covers climate change, European turmoil, gender empowerment, manufacturing, citizens and better scaling of innovations. Each trend also includes a question for your business. a more targeted approach for heavy industries, at risk of closing down or relocating abroad, due to increased pressure to reduce global warming emissions. EU Environment Ministers are met in Luxembourg on Monday to hold their first policy debate on the review of the EU emissions trading system (EU ETS) since the European Commission tabled its proposal on 15 July. The ETS is the world’s biggest scheme for trading emissions allowances. It puts a price on CO2 emissions in an effort to guide investments into low-carbon technologies. However, at less than €8 a tonne, the price of carbon is too low to drive the transition to clean energy. Data from the European Union has shown that the UK is among the best in Europe at resource productivity. Resource productivity measures the relationship between economic activity through GDP and the consumption of natural resources. As a result, it shows how efficiently resources are used. The data provided by Eurostat, may also be used as a key indicator of the progress being made towards a circular economy. Europe’s biggest countries are lobbying for a proposed EU cap on nitrogen oxide (NOx) pollution from cars to be weakened in a vote on Wednesday, despite the VW diesel emissions scandal and revelations that 90% of cars do not currently meet pollution standards when on the road. The UK has called for NOx emissions at twice the current legal maximum to be allowed until 2019, and for loopholes after that to permit emissions 40% above the European commission’s proposal of 80mg/km, the Guardian understands. Gaining access to environmental data in Brazil might seem easy —until you try to do it. For example, when Brazilian companies apply for an environmental permit, they are required to publish an environmental impact assessment and hold public meetings. In theory, the assessment would provide environmental data and details about the project; however, in practice, people often can’t access this information. To read these documents, citizens would have to go to the environmental agency during business hours and sift through hundreds of pages full of technical jargon. About 1,000 Bikini islanders have applied to relocate to the United States as rising seas threaten their adopted home. The residents were moved from their Pacific atoll as result of atomic bomb tests in the 1940s. But their new home, on another of the Marshall Islands, is struggling against huge tides and increasing storms. The islanders have now asked Washington to change the terms of a trust fund to allow them settle in the US. The UK and Chinese governments have signed an agreement to share knowledge and encourage investment in clean energy technologies in both countries. The Clean Energy Partnership will enable UK companies share their expertise in low-carbon innovation and secure new business in the Chinese energy market, the largest in the world. It is also hoped that the deal will encourage more investment in clean technologies, helping reduce costs to consumers in both countries. Both design and health professions are increasingly aware of how our environment impacts our wellbeing. Concerns have evolved from sanitary conditions and communicable disease transmission in past centuries to an unprecedented increase in NCDs (non communicable diseases or “lifestyle diseases”) over the last few decades. Recent urban development patterns often fall into two extremes: horizontal sprawl and hyper density, with both producing new challenges to the health of inhabitants. The way we shape our environment, and consequently our lifestyles, has a significant impact on our wellbeing and longevity. The Persian Gulf is already one of the hottest parts of the world, but by the end of the century increasing heat combined with intense humidity will make the region too hot for habitation, according to research published in Nature Climate Change. Heating and air conditioning currently permit humans to live everywhere from Siberia to the Sahara. However the extreme heatwaves predicted for the Gulf, where temperatures will regularly hit 50℃ or even 60℃, will reach the limits of the thermal adaptation that buildings can provide. Currently, many residents of the gulf can find refuge in air-conditioned homes, shopping centres and cars. But as temperatures increase, so does the need for cheaper, more sustainable, less energy-intensive ways of staying cool. Fortunately, the region’s past offers a rich source of architectural inspiration. AUSTRALIA – The Queensland government this week released its Draft Infrastructure Plan for the state, with good news for rail, light rail and bikeways, and a plan to work on climate change resilience, sustainability assessments and lifecycle costings for infrastructure projects. But the bad news is that the among infrastructure funding includes allocations to support rail for expansion of coal mining in the Galilee Basin and coal seam gas extraction in the Surat Basin. Comments on the draft SIP are open until 4 December 2015. The Nightingale apartment development in Melbourne’s inner city Brunswick was set to break all the rules of conventional development: highly sustainable design, disruptive finance modelling bringing prices down significantly and no cars; residents would instead be issued with “green travel plans” for public transport. But last week those plans were scotched when an action brought by an adjoining developer won its bid in the Victorian Civil and Administrative Tribunal to overturn Moreland City Council’s approval of the project… But there’s a bright side – this kind of development, which switches the focus of development profits on its head, turning the benefits from the developer to the people who will live in the property, is not about to disappear. In fact, it’s just about to ramp up big time.